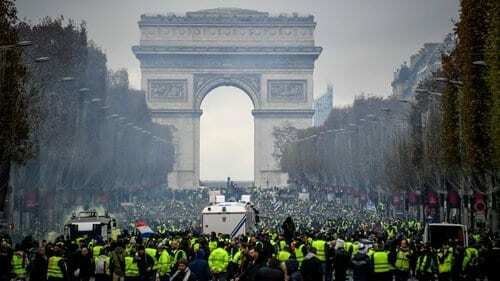 The Champs-Elysees has since last month been the epicentre of repeated violent protests against Macron’s government, with the Arc de Triomphe ransacked on December 1. In Paris the “yellow vest” anti-government protests that have rocked President Macrons administration is set to be held on Saturday and New Year’s Eve, and continue into 2019. Several of the movement’s representatives said a seventh straight Saturday of protests will take place across the country this weekend. The Champs-Elysees has since last month been the epicentre of repeated violent protests against Macron’s government, with the Arc de Triomphe ransacked on December 1. Violence is inevitable. Yellow-vest representative Benjamin Cauchy said protesters would be out on New Year’s Eve as well, “to show that the mobilisation will not end in the new year”. Cauchy also warned that if the concessions made so far by President Emmanuel Macron did not add up, “we will end up with a large-scale mobilisation in late January”. Earlier on Thursday, Paris city officials said that New Year’s Eve celebrations on the Champs-Elysees will go ahead despite the protest plans on the famed avenue. Tens of thousands of tourists and locals traditionally ring in the new year on the wide shopping boulevard, which ends with the Arc de Triomphe monument. While the numbers turning out at protests across the country have fallen dramatically, several thousand people are listed on Facebook as planning to attend what it calls a “festive and non-violent event” on New Year’s Eve. And officials from the organisation suggest that the New Year Eve’s protest will encourage many others to join the movement. In the past month, France has seen cities in chaos, cars on fire, police using water cannons as violence and chaos have erupted out of control. French President Macron was left red-faced at the G20 summit where he was forced to yield to some of the demands of the protestors and reverse some policy changes. The Champs-Elysees being prepped for the New Years Eve celebrations in Paris, the Yellow vests intend on persisting through the cold to make sure their voice is heard. The avenue is a regular gathering point for national celebrations such as Bastille Day, the Tour de France and France’s victory this summer in the football World Cup. But on recent Saturdays, it has been the scene of violent clashes between riot police and “yellow vest” protesters who accuse Macron of favouring the rich with his policies. Flights rerouted as Indonesians suffer more misery as the death toll rises.